The biggest win for the game was in getting the audio team at Skywalker involved and invested in our project, working with us on ‘movie style’ post-production sound for a game. We effectively defined what ‘movie style post-production on a game’ was. This allowed us to carefully plan in advance four whole weeks of off-site audio production, completely undistracted by our regular meetings, concentrating on only the sound of the game and how we could improve it. This all happened at the end of post-production when the changes we made made had the most impact overall. In our preparation we spent time leveraging our in-house technology to best fit the working styles of movie sound professionals in the form of a tactile mixing desk interface for controlling in-game parameters. Best of all, having the input of a fresh and enthusiastic post-production audio team injected a totally renewed passion for the quality of the game audio into the entire sound team, who had up until that point been working on that single project for three years. Each character that was designed had around 10 categories of reaction, and for each of those categories they had around 10 variants of line that could be played each time one of those events occurred. This meant that each character had around 100+ lines, not to mention all the cinematic lines and mission specific dialogue that were required. A great deal of the additional dialogue for the in-game characters was written by writers local to us in Vancouver, they essentially churned out a huge quantity of situational one-liners for hundreds of characters resulting in over 33,000. Though unavoidable and clearly for the greater good of the game, the change of direction for the project midway through development brought about by a six month extension to our Alpha date, and presented challenges for the dialogue system and for the flexibility of the content we had already recorded. These changes meant that many scenes that had been written for the story were cut completely, and although some scenes were re-appropriated they did not make as much coherent sense as the full scenes they used to be. 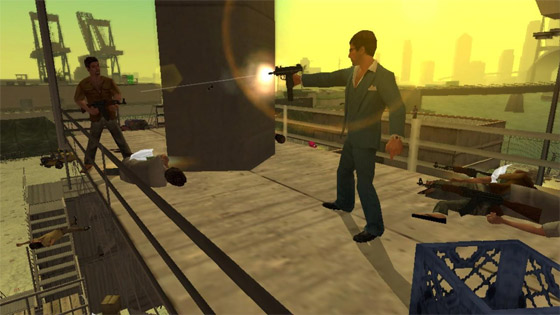 Many characters were also cut from the game, as well as many side missions for which very specific characters had been created, cast and recorded. Those characters now were only to appear in the game world as pedestrians, which made them seem a little odd without their context. With all the ripples that the extension gave us, these changes led eventually to a much more streamlined and solid product. The extension in the amount of time we had also allowed us to plan and execute the post-production mixing, and thus gave us a huge gain in terms of final audio quality. Production of the huge amounts of cinematics that we have in the game was eventually cut off around two weeks before we went off-site to Skywalker to mix the game’s audio. This gave us a mere two weeks to work on Foley performance, recording and editing for those scenes. Due to the huge amount of cinematic cut-scenes in the game, we had to prioritize the more important ones to receive the attention of full Foley, as there simply was not enough time to perform Foley for all the cut scenes we had. Our internal Foley team, Scott Morgan, Cory Hawthorne and Roman Tomazin, worked for a solid week in performing the Foley, and then a further week editing and bouncing down the Foley mixes for integration into the sessions which contained SFX and dialogue. 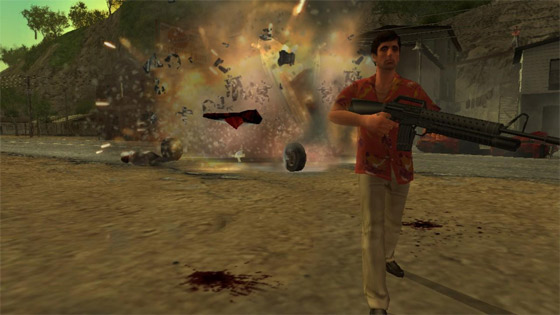 This practically left no time to do mix-downs of the final sessions including dialogue and sound effects, so the team were put under a great deal of pressure to bounce out and mix all the cinematics for the game in both Pro Logic II encoded versions and in Dolby 5.1 six channel mixes. These were all bounced out over the course of two or three long evenings and the intention was not to touch these mixes once we got to Skywalker. However, once arriving on the stage we found we needed to add more sounds and balance the sounds in some of the cinematics, so as we came to them we re-bounced them on the mix stage. A dedicated month for Foley and premixing the cinematics is a must for future productions of this scale. Recording the amount of dialogue we did, in excess of 33,000 lines, was a huge undertaking. Recording wasn’t completed until March 2006, totaling almost a year and a half of VO casting, recording, editing and implementation. One of the things that contributed significantly to this amount of time was the extension to the project half way through the first phase of our recording, and therefore new designs and ripples in the narrative meant new characters and new scenes, and a good amount of callback sessions were required half way through production. Improvements to the dialogue system soon became evident when we realized the huge amount of content we had to manage. A simple, dedicated database system would need to be developed to enter, sort, organize, print, edit and debug all the dialogue. We used Microsoft Excel to manage the entire dialogue on this project, which although workable, proved very hard to manage and debug, making dialogue management a full-time job. It also proved inflexible later on in development when we needed to re-appropriate lines of dialogue to be used in new situations, as our naming convention dictated the use of dialogue in the game to a great extent, and meant we had to duplicate and rename content in order to get it used in new places in the game. The development of a flexible system, which treats functionality independent of filename and which packages the files needed per character only at the build process, would help tremendously on similar scale projects.